Gastritis may occur suddenly (acute gastritis), or appear slowly over time (chronic gastritis). In some cases, gastritis can lead to ulcers and an increased risk of stomach cancer. For most people, however, gastritis isn't serious and improves quickly with treatment. Gastritis doesn't always cause signs and symptoms. Nearly everyone has had a bout of indigestion and stomach irritation. Most cases of indigestion are short-lived and don't require medical care. See your doctor if you have signs and symptoms of gastritis for a week or longer. Tell your doctor if your stomach discomfort occurs after taking prescription or over-the-counter drugs, especially aspirin or other pain relievers. Gastritis is an inflammation of the stomach lining. 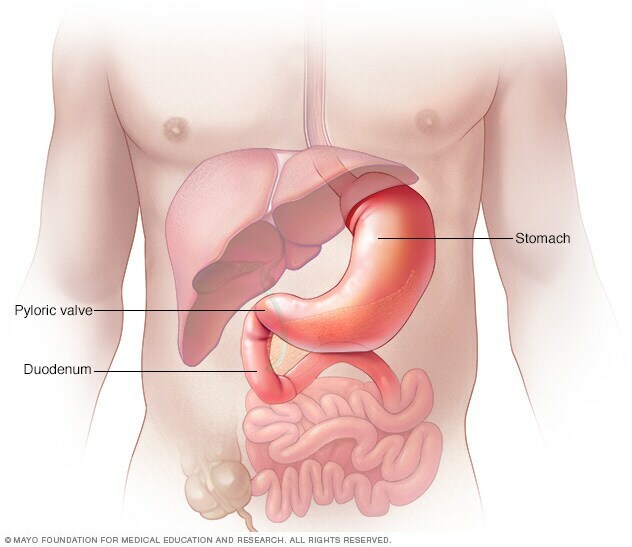 Weaknesses or injury to the mucus-lined barrier that protects your stomach wall allows your digestive juices to damage and inflame your stomach lining. A number of diseases and conditions can increase your risk of gastritis, including Crohn's disease and sarcoidosis, a condition in which collections of inflammatory cells grow in the body. Regular use of pain relievers. Common pain relievers — such as aspirin, ibuprofen (Advil, Motrin IB, others) and naproxen (Aleve, Anaprox) — can cause both acute gastritis and chronic gastritis. Using these pain relievers regularly or taking too much of these drugs may reduce a key substance that helps preserve the protective lining of your stomach. Your own body attacking cells in your stomach. Called autoimmune gastritis, this type of gastritis occurs when your body attacks the cells that make up your stomach lining. This reaction can wear away at your stomach's protective barrier. Autoimmune gastritis is more common in people with other autoimmune disorders, including Hashimoto's disease and type 1 diabetes. Autoimmune gastritis can also be associated with vitamin B-12 deficiency. Left untreated, gastritis may lead to stomach ulcers and stomach bleeding. Rarely, some forms of chronic gastritis may increase your risk of stomach cancer, especially if you have extensive thinning of the stomach lining and changes in the lining's cells. It's not clear how H. pylori spreads, but there's some evidence that it could be transmitted from person to person or through contaminated food and water. You can take steps to protect yourself from infections, such as H. pylori, by frequently washing your hands with soap and water and by eating foods that have been cooked completely.